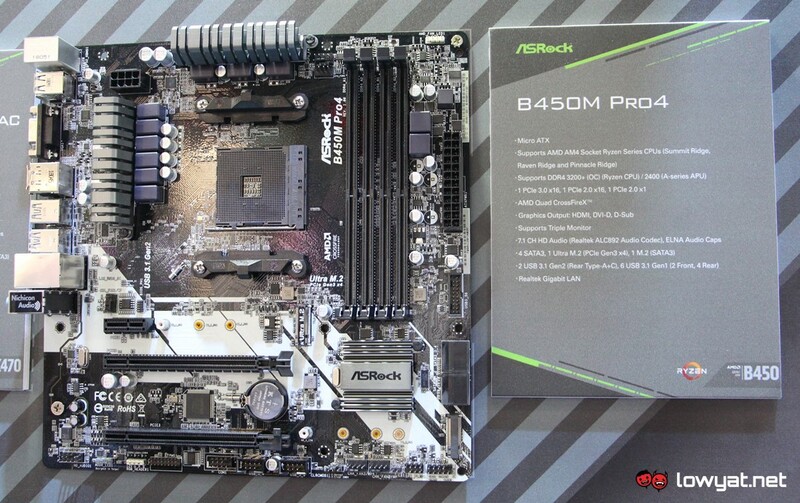 Following ASUS, ASRock has also announced new motherboards that are based on AMD B450 chipset in Malaysia. The company announced on its local Facebook page that three such motherboards are now available immediately in the market. 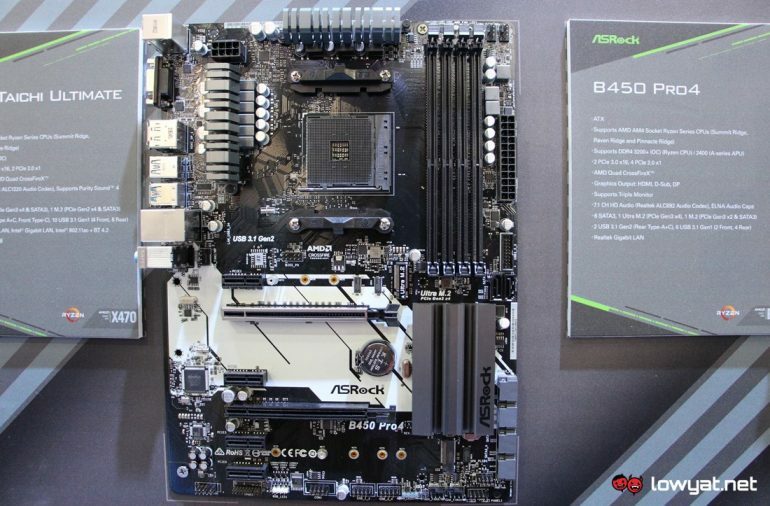 Let’s start with the B450 Pro4 and the B450M Pro4 which are generally almost similar to each other, with the latter being the microATX model of the former. Draped in black, both motherboards feature premium 42A power chokes as well as two ounces of copper in their inner layers for lower temperature and higher energy efficiency. Differences in size aside, the B450 Pro4 does come with two PCIe 3.0 x16 slots while the slots on the B450M Pro4 is split between a PCIe 3.0 and a PCIE 2.0 slot. While both boards do come with HDMI and VGA (D-Sub) ports, the larger board also offers a DisplayPort 1.2 while the smaller board is equipped with a DVI-D port instead. 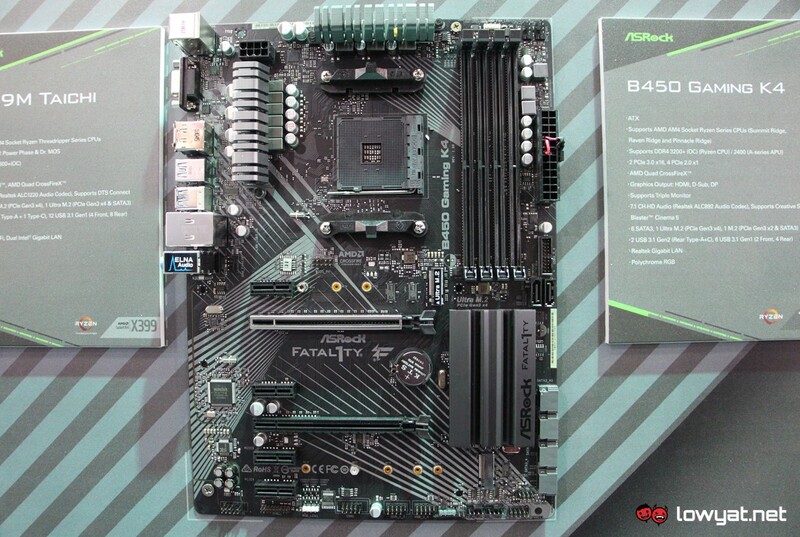 Leading the first batch of ASRock B450 motherboards in Malaysia is the Fatal1ty B450 Gaming K4, which comes with most of the features from the two other B450 motherboards alongside additional bells and whistles. For example, the motherboard features a built-in RGB lighting on the heatsink of its chipset and is able to support additional RGB lights through its multiple RGB headers. In fact, one of the RGB headers is designed specifically for addressable RGB lights. At the same time, the motherboard also comes with a dedicated Fatal1ty mouse port which, with the help of the F-Stream software, lets users sets their own mouse polling rate between 125Hz to 1000Hz which is something that might be interesting to gamers out there. While all three motherboards mentioned here feature integrated 7.1-channel audio capability powered by Realtek ALC892 audio codec, only the Fatal1ty B450 Gaming K4 supports the Creative Sound Blaster Cinema 5 software. Price-wise, the ASRock B450 Pro4 and the B450M Pro4 can be obtained for RM399 and RM339 respectively while the Fatal1ty B450 Gaming K4 costs RM439.